If you drive a car, truck, van, or motorcycle you’re required to register your vehicle and obtain license plates for the Department of Revenue. When applying for your license plates, you can choose specialty plates or personalize them with a unique plate number. Some license plates may have fees in addition to the standard registration costs. With your registered plates on your vehicle, you’re able to drive legally on the road until the expiration date on the decals. When you purchase a new vehicle or bring your out-of-state vehicle, you must register it with the DOR. You may have to visit the DOR in advance to pick up temporary license plates for your vehicle. Temporary license plates are valid for 7 days which allow you to pick up your vehicle, and drive legally until your vehicle’s registration is completed. 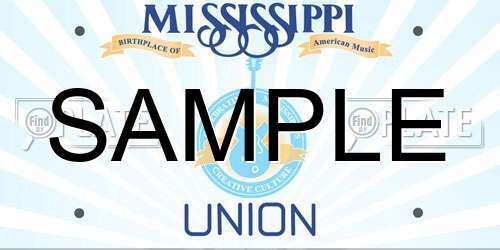 To apply for license plates in Mississippi, simply visit a DOR office and file the appropriate application forms. If you’re a new resident, you have 30 days to register your out-of-state vehicle. IF you recently purchased a new vehicle, you have 7 days. The cost for personalized plates are $31 in addition to standard registration fees. You should always look up available license plates before applying. E.g. Soil conservation, Autism awareness, etc. E.g. University of Mississippi, Louisiana State University, etc. E.g. Alpha Kappa Alpha, Phi Beta Sigma, etc. E.g. Fraternity Order of Police, Firefighters, etc. E.g. shriners, Knights of Columbus, etc. Contact the Mississippi DOR for a complete list. E.g. Ex-Prisoner of War, Pearl Harbour Survivor, etc. E.g. hot rod, antique, etc. Each plate has different fees in addition to the standard plate registration fees required. Contact the nearest DOR office for more details along with a completed list of all specialty plates available. In Mississippi, you cannot transfer your license plates to a new vehicle or a new owner. You plates remain with you. When you purchase a new vehicle, you can transfer your plates accordingly. When you no longer need your license plates, you can surrender them to the nearest office by mail or in person. It is possible to receive a refund for any unused credits on your registration. Please visit the DOR office to apply for a refund. If you’ve lost, damaged, or have had your plates stolen, you should replace them immediately. You must report your plates stolen to the police and obtain the appropriate forms from your county’s tax collection office. It may take time to issue new license plates if you had personalized or custom plates and wish a similar replacement. Simply submit any required documents and pay the renewal fee to receive your new decals. You can place the new decals directly over top of the old. When you register your vehicle, you may also be expected to pay taxes and other state fees. You can find more information by contacting your local DOR office. In Mississippi, you can look up license plate using FindByPlate. You can find available plate numbers for personalizing your license plate. Additionally, FindByPlate lets you see additional background information about a vehicle registered to a particular plate number. Lookup a license plate in Mississippi here.